Batman & Robin has become the comic book movie shorthand for “cluster**k bomb” since its release, with character overload and Arnold Schwarzenegger’s mangled Mr. Freeze line-reads standing as touchstones of terrible. Every time a new property is translated from stapled newsprint to celluloid, B&R is always there, poised at the fingertips of the internet fanboy cognoscenti, ready to be uncorked in This movie is as bad as Batman & Robin, or Now way in hell is this movie as bad as Batman & Robin message board declarations. 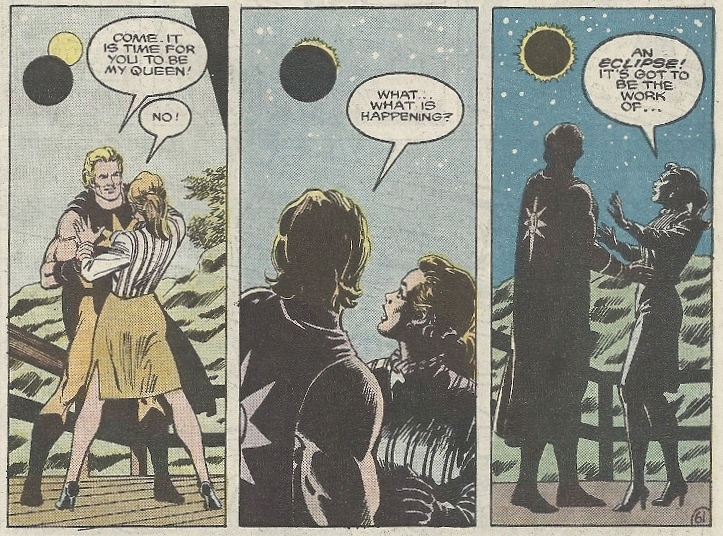 It’s thus become the Ishtar of comics on film, a cautionary tale of all-star casts gone awry. Tread near its mephitic stench at your own peril. 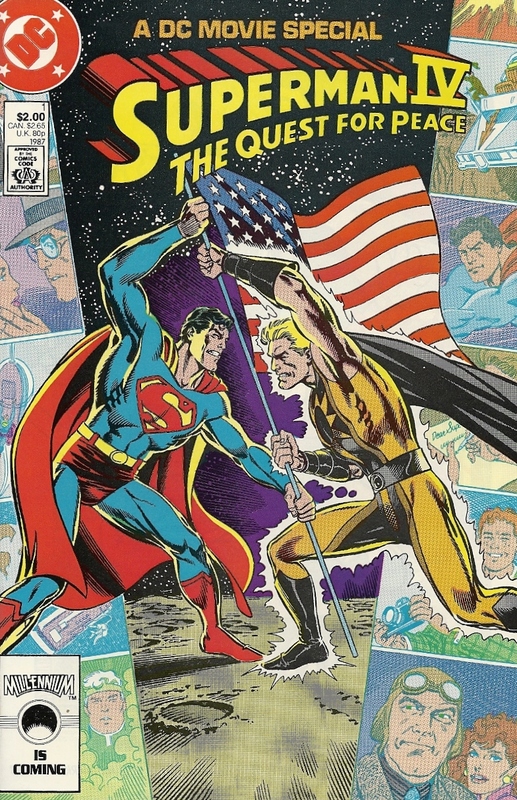 This is very unfair to Superman IV: The Quest for Peace, because that movie isn’t just a horrendous comic book adaptation, it’s a dreadful movie period, end of sentence, end of paragraph, set the type and send it to the printer. It has the dumb story, dodgy effects and general haphazardness necessary to cook up a righteously rank stew. That it was the last super-screen appearance for Christopher Reeve, who had managed to embody all that was good about the Man of Steel, only amplified the atrocity — and does so to this day. So, of course, we should all dive in face first. Superman IV is one of those movies where you don’t even know where to start. Yes, Reeve was back in action (so to speak) as Superman, but he didn’t quite fill out the suit as well this time around (he wasn’t being trained by the Darth Vader suit-filler himself, David Prowse, anymore). Sure, the great Gene Hackman returned as Lex Luthor (a somewhat divisive figure even in the better two films), but instead of Ned Beatty and the gloriously breasted Miss Teschmacher as his hench-people, he now had a young Jon Cryer as his nephew/flunky, who turned in a performance that to this day makes viewers want to chuck things through windows. Margot Kidder, shunted aside as Superman’s love interest in Superman III, was once again relegated to the romance back-burner, and was this time replaced by Mariel Hemingway, granddaughter of Ernest and proprietor of the flattest turn since Sofia Coppola was pressed into The Godfather: Part III service. And Nuclear Man. Oh Nuclear Man, we hardly knew ye, with your wind-up toy powers, your voice dubbed by Hackman, your tinfoil suit, your beach bum hair and your radioactive Lee Press-On Nails. Mark Pillow showed up one day on set with his Venice Beach-y good looks, as if he too had been birthed in the sun, and just as promptly disappeared, never to be heard from again. Perhaps for the best. This is just the cast and characters we’re talking about, and we’re already in trouble. 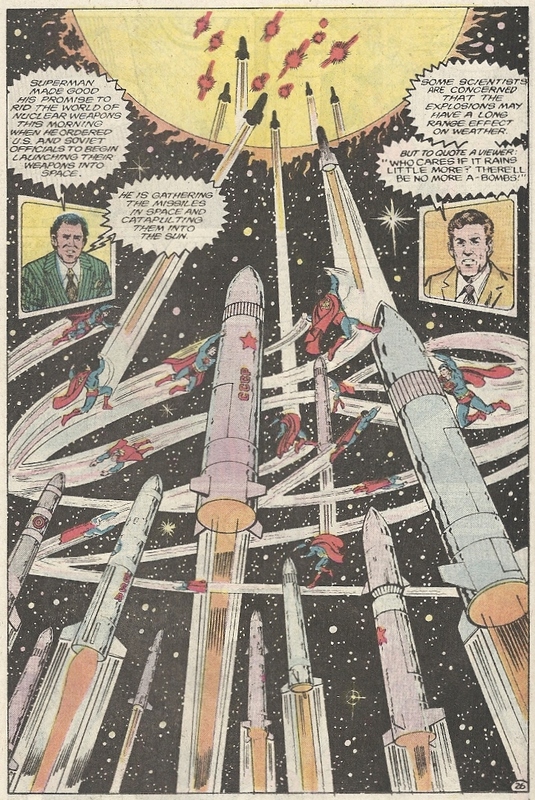 Peace started out with an interesting enough premise, one devised in part by Reeve himself: what would happen if Superman actually dug into real geopolitical problems, in this case nuclear arms proliferation? What if he got rid of them all in one fell swoop? What are the morals of that, the unintended consequences? Is he our servant or our ruler, or some mixture of the two? Granted, the plot has him going through the auspices of the United Nations, neutering some of the top-down dynamic (and making this an agitprop forerunner of World War Z), and it all degenerates into punching anyway, but the thought-provoking sentiment is still there. 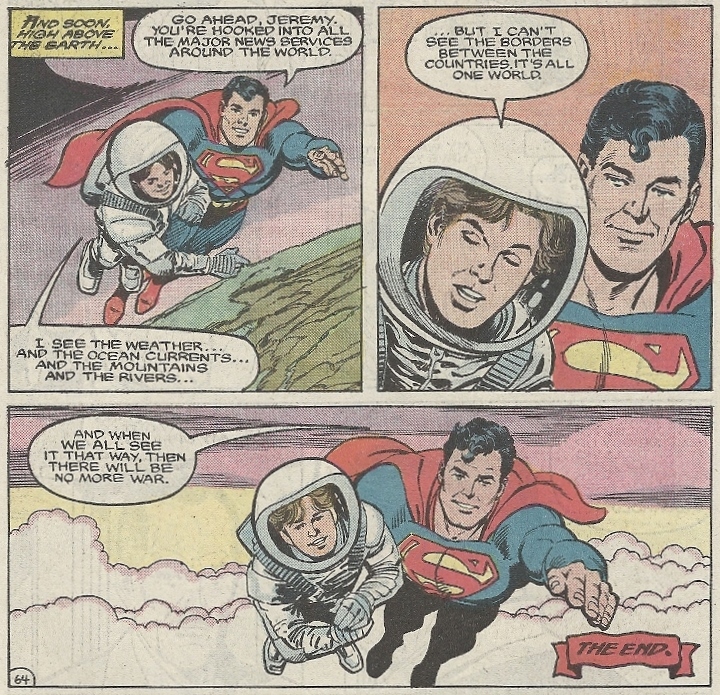 We should recall that in 1987, the year this comic was published, Swan had been pushed out the door as the foremost Superman artist, and John Byrne was relaunching the post-Crisis character in The Man of Steel and the fresh Superman series. It’s doubtful, but one wonders if this wasn’t a little bit of Swan thumbing his nose at the new editorial direction that had kicked him to the curb. The comic, for whatever it’s worth, is better than the movie, though that’s not saying much. 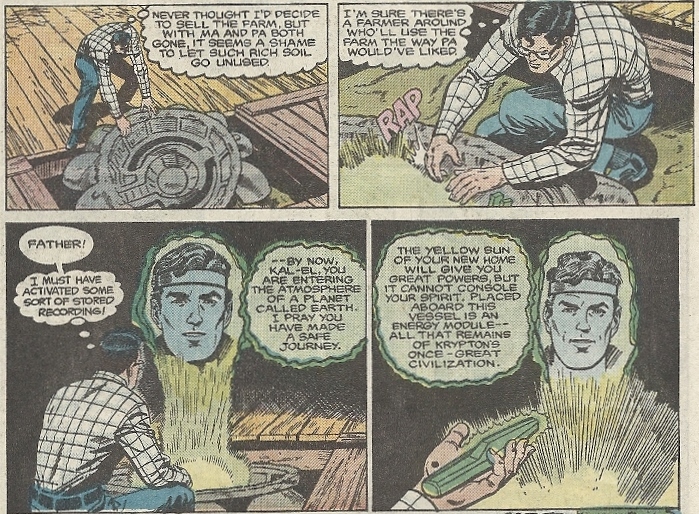 Superman usually flows better on his native medium’s soil, and this isn’t an exception to that general rule. But these pages can never Lysol away the stink of the movie. Nothing can. 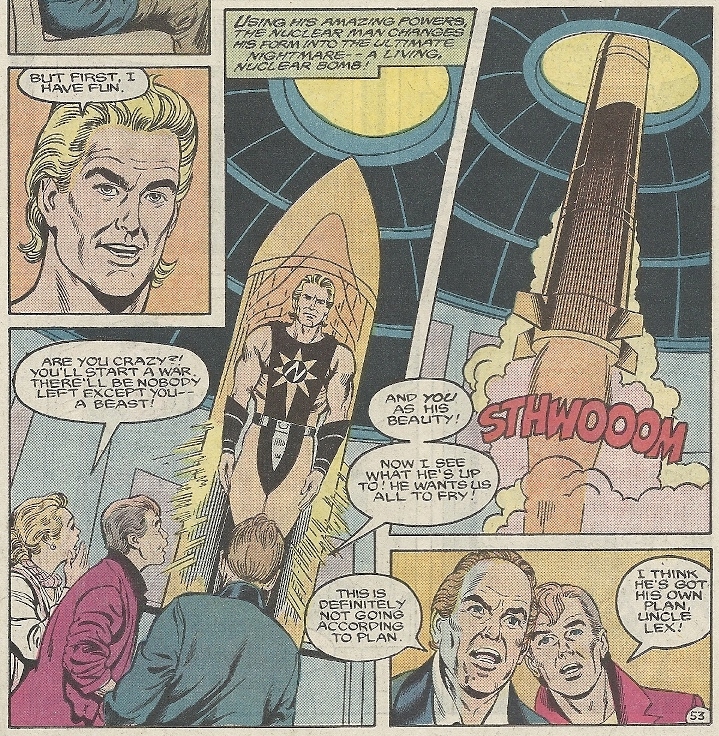 As alluded to before, it’s a shame that this was the final view we ever had of the Reeve Superman. Yes, Superman Returns was a long-form tribute to his wholesome grandeur, but its imitation was just that: imitation. It was a photocopy, not a genuine original. I harbor a hope that in a couple of decades CGI will be honed to such a degree that Reeve’s take can be resurrected once more. That’s our only hope to exorcise this mediocre demon known as The Quest for Peace. Come on, Science, get your act together. I’ll close with this: One of the oddest things I came across when doing some brief reading for this post came was when I watched several clips on YouTube. I scrolled down to the comments and saw words to the effect that Well, it’s still better than Man of Steel. I saw this more than once, more than twice, more than a dozen times. Even taking into account the trolling hyperbole found in internet comment sections, this stands out for preposterousness. These people clearly need to recalibrate their bad Superman movie meters. Hopefully this post and its predecessor will be of assistance. Excelsior.